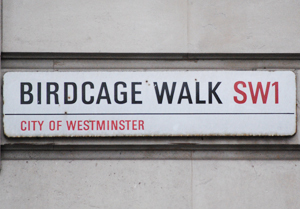 The street now known as Birdcage Walk – which runs along the southern side of St James’s Park – refers to the former aviary and menagerie which was located in the south-eastern corner of the park during the reign of King James I in the early 1600s. As well as the exotic birds which give the street its name, the menagerie of King James I – who drained marshy ground on which the park now stands and first had the park landscaped – was said to have included camels, crocodiles and an elephant. The aviaries were apparently expanded during the reign of King Charles II later that same century. It was around this time – in 1664 – that pelicans were first introduced into the park when presented to the king as a gift from the Russian ambassador. Only the Royal Family and the Duke of St Albans – Hereditary Grand Falconer – were reportedly allowed to drive along Birdcage Walk until 1828 when it was opened to the general public. Interestingly, Storey’s Gate, a narrow street runs south from Birdcage Walk to Westminster Abbey, is actually named after Edward Storey, who was “keeper of the king’s birds” during the reign of Charles II. have you seen my post on the taxidermy at the Queen Anne’s Gate house I visited last year? http://visitinghousesandgardens.com/2013/02/13/large-grand-single-18th-century-dwelling-houses-in-central-london-16-queens-anne-gate/?